And there it is - an LGM-30G. Or, as I'd heard them called before, "Minuteman III missiles." For the time being, it's the most accurate illustration of such a device available to the public. 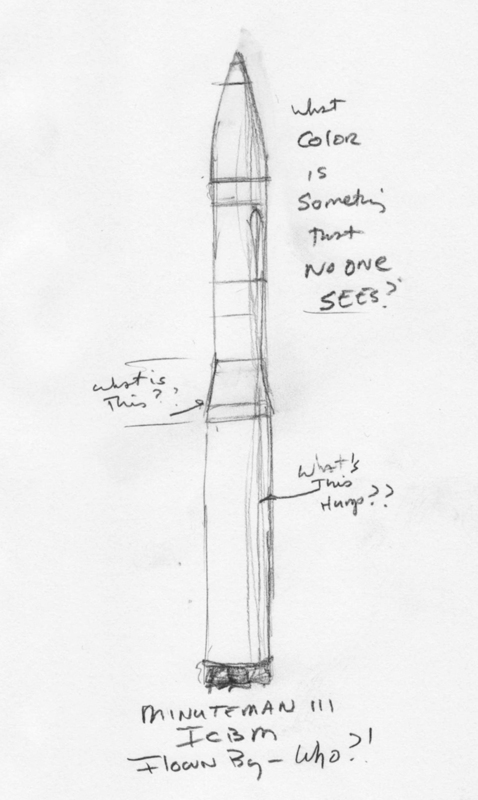 But you should also know this - it's the only illustration of such a device, too. Typically, I list the name of the veteran who flew/crewed/used whatever 'thing' in the headline. But for the next four or five minutes, I'd like to keep his name anonymous. Why? Because, in his own words, he represented an 'anonymous' service. "I'm proud of being a Missileer," he said. "And no one knows what we do. You need to tell our story." I have to admit - I knew so little about them, I thought "Missileer" was one of those slang names used to describe people. Sort of like "gear head," "foodie" or "Army brat." However, I now know the truth of the matter - Missileers are the last human human link before nuclear Armageddon. There's nothing slang or casual about Missileer. I've learned much about this fascinating and sobering group of men and women. But for me, one of the most striking moments occurred when my patron slid a DVD of the seminal TV movie, "The Day After" across my conference table. "Watch this. There's a part you need to watch," he said. Hold that thought, I need to take a rabbit trail for a moment. In my interviews, I ask a lot of questions and there's a system to them. But this time, they went by the wayside. The sheer nature of what was at-hand tempted me to lose discipline and cut to the chase of what I was really thinking - "So. Could you really have done it?!" In other words, did he really have the gall to push the button and launch World War Three?! "Absolutely," he said without a moment's hesitation. "You robot!" I thought, surprised at my own repulsion at his apparent reflex. Now, don't get me wrong. This wasn't the first time I'd had contact with world destruction. When I interviewed Morris Jeppson - the Bomb Electronics Officer on the Enola Gay - I was and remain gung-ho on the decision to level Hiroshima and Nagasaki. But here? Today!? I thought this missile-guy might have been nuts. He knew what I was thinking, too. "Look. You have to know something about those missiles," he said, leaning forward over the table. "The nukes aren't the deterrent for nuclear war. And...they never were." "We are the deterrent." He pointed to his chest with his thumb. "It's not the missile. It's the training, the focus and the ability of the people to actually do the undoable that's the deterrent. As long as we're ready, as long as we're able..."
I finished his sentence. "...you won't." "Correct. At least in dealing with rational people, anyway." "Yeah. I think we all considered our Soviet counterparts of equal mind." He rested back in the chair. "We wouldn't do it because we were totally prepared to do it. See? That's why you're doing this missile. I want my grandkids to know." Grandkids! What a word to come up when discussing the destruction of most of the human race! And this is a good time to look up again at that screen shot. 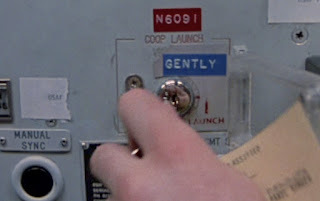 Here's why the word "Gently" is so significant. During training, the Missileers go through the drill of actually launching the nukes. All the drama, all the checks, all the pressure is brought to bear on these men and women to ensure that when the time comes, they can assuredly counter a nuclear assault. There are no big-red Launch Buttons. Instead, the launch is executed by inserting and turning a Launch Key. During this training, the tension is so great, keys have been ripped-off in the socket! Hence, the reminder - "Turn the key, gently." But only in the Training Facilities because in the real, operational missile sites, it doesn't matter if you break the key off because...there won't be anyone around afterwards to care. 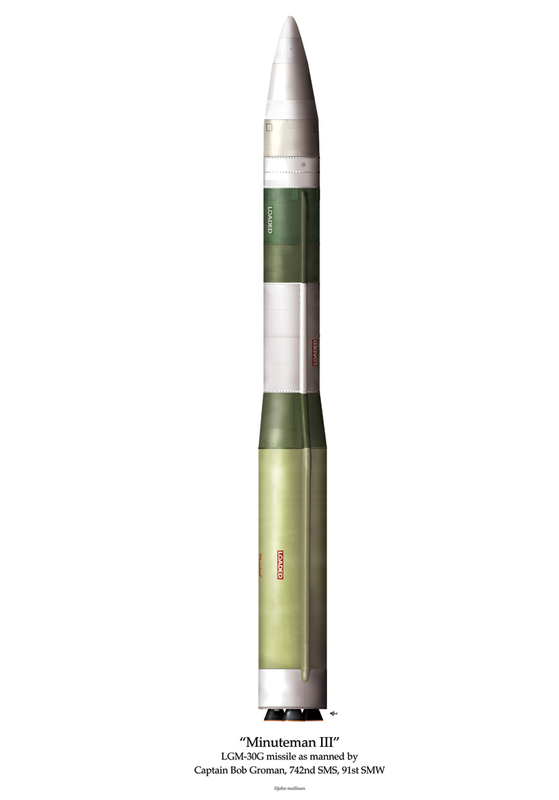 The term "Missileer"? Chances are good you were like me and hadn't given them any regard before this project. But now, they'll never be forgotten. Note to the politicians of the world: Gently, indeed. There are grandkids to think about. 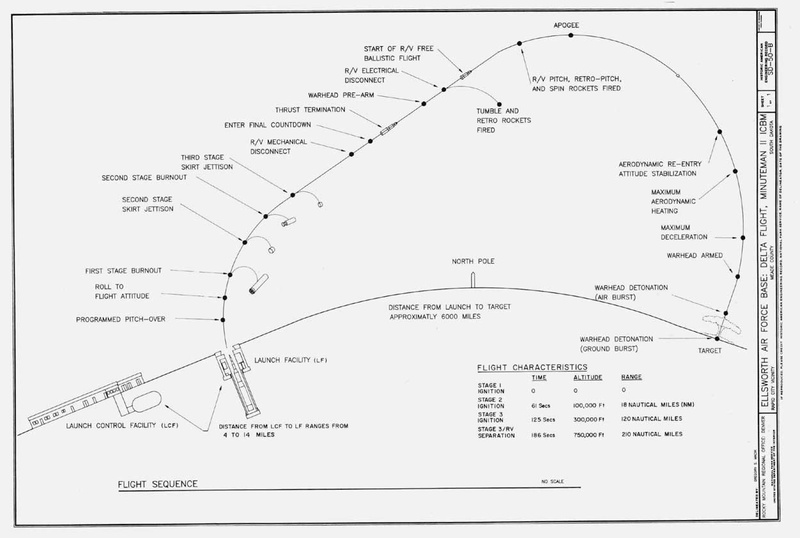 This illustration and posting courtesy of Bob Groman (91st SMW). 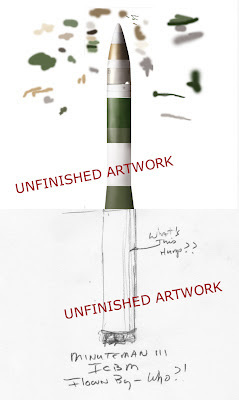 To people interested in having prints of this missile, click here. That's Don Bryan, devoted husband, lovable crank, brilliant philosopher and WW2 ace. And that's a little girl in a crowd at a 352nd Fighter Group reunion a few years ago. I'll let you in on the back story. We were at a Georgia airport where the Veterans had gathered to see P-51 Mustangs decorated in their signature blue-nosed markings. Like many of these events, a crowd of "groupies" showed up, hoping for autographs and handshakes...and Don loved to play along. Now... there were two things about Don that I had noticed. One, for all the back slapping, joke telling and roaring stories, that he could attract, he was smart - whip smart. How I learned that is another story but for now, imagine an Old Western movie where the bad guy draws on a distracted sheriff only to have his gun suddenly shot away by the sheriff's lightning-like reflex; "Son. You'd better know who you're trying to shoot before you shoot." That sheriff would be Don. The other thing about Don was that he defined the phrase "straight shooter." Though cat-clever, he had no guile. If he said it, he meant it. I got the impression that to him, anything less than "the way it is" was somehow not completely true and therefore, a lie. Bah...I could write forever on Don Bryan. For now, I'll just state this - he's awesome. Anyway, back to the picture. 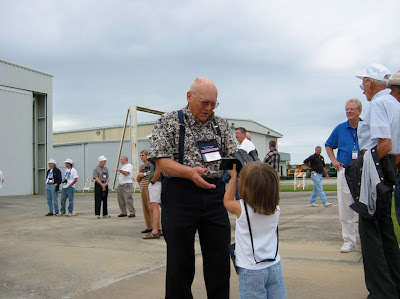 Don had made his way around the Ramp, shaking hands, laughing loudly and eventually came upon the little girl. In "Grumpy Grandpa" character, he put his hands on his hips, narrowed his eyes and roared, "And who are YOU?!" Don had been carrying that video camera and as he pretended to start recording, (and put a little good-natured fright into the kid) the girl got on her toes and growled, "I'm Abbie. And I'm going to be an Astronaut. Who are YOU!?" "You're...' He stammered, voice crackling with incredulity. "You're what!?" She admonished with a slap of disgust, "I'm going to Mars and you know who I am!" See, she'd met Don the night before at the Reunion hotel. Was even tickled. And Don, in his gregarious glad-handing, momentarily forgot that kids have even less tolerance to BS than he did himself. She simply stopped the man cold. "Yes. Yes you did, Abbie." The character came off. "Here. You film me." He gave her the camera. "I want to be filmed by an Astronaut." That's about when I took the picture. It's really just a cute story that probably has little worth to anyone outside of me and my wife because the little girl is my daughter. But I have to say this - over the years, Don remembered, "His little astronaut" at Christmas, in emails, letters...encouraging her to rise to her dreams and achieve her goal. He let me know in no uncertain terms. "John, she's in a world where she can be an astronaut! And if she can, she must." Don's encouragement hasn't been lost on Abbie. Hanging in her room, there's a box-shaped spaceship that, a couple grades ago, she made for a school project. 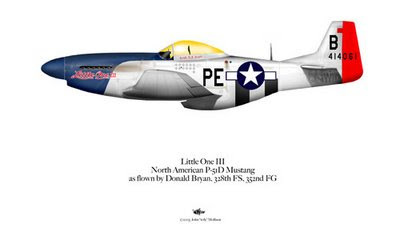 It looks about what you'd expect a home-made spaceship made from a cardboard box would look like except it has a blue top and is named "Little One...IV"
Don was one of the first WW2 pilots I interviewed, My ancient art of his P-51 is below - "Little One III" - and named for his wife, Francis. But he will live forever. And quite possibly, ride into space, too. Here's the latest update. It's about 40% finished. Unfortunately though, I'm probably going to do it all over. Think about it. This missile is not like doing a proper winged warbird. 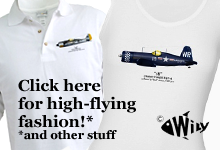 Nose art, paint schemes, mission markings? They're utterly useless. And it's not like the Missileers would ever get any particular pride out of a sharks-mouth or curvy pinup painted on the nose. Instead, I'm sitting here trying to figure out Fungicide and Cork. Yes. Fungicide and Cork. Have a look at what I've managed so far. But I'm a little confused about it. See, a significant part of it was covered with cork - the same stuff that shoots out of champagne bottles. How's that for irony? But the similarity between missile and merlot doesn't stop there. Both slumber silently in the cool dark until the hour of need, protected by cork against evil elements that work towards their demise. To the wine, the evil element is Air. Cork preserves the wine because it resists rot, doesn't shrink and prevents premature oxidation by keeping air out. Air doesn't like missiles, either. Accelerating through the atmosphere to 15,000+ mph, the pressure of high-velocity and heat generated from friction are extreme. But the cork provides a physical barrier absorbing the brunt of such forces by slowly and predictably sacrificing itself along the way. If you want a new word, the mechanical term for this mechanical self-destruction/preservation is called "Ablation." However. Standing vigilant in its concrete cellar for days, months (hopefully forever) the cork itself is subject to its own battle. A battle against - of all things - fungus. Imagine this scenario; a fungus attacks a certain part of the nose and begins to eat it away. 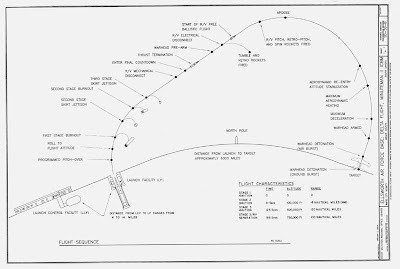 Suddenly, launch-time happens, the missile goes...but somewhere around 200,000 feet, that portion of the ablative covering fails prematurely. The result could be…well… terrible. We can't let a mere fungus stand in the way of a nuclear exchange, can we? (ha ha ha - more irony). So, in order to protect the cork, a fungicide was added, resulting in a (as yet) mysterious green hue. In other words, our nation's "second strike capability" may well have been teetering upon CORK FUNGUS! Right now, I'm being driven two notches below insanity trying to figure out what the green color was, how much cork covered 'what' and do it all in a fashion that doesn't demand sneaking into a top-secret facility with a digital camera. I believe I need to open a bottle of wine as an ablative to keep myself from going crazy waiting for my sources to figure out what needs to be known. 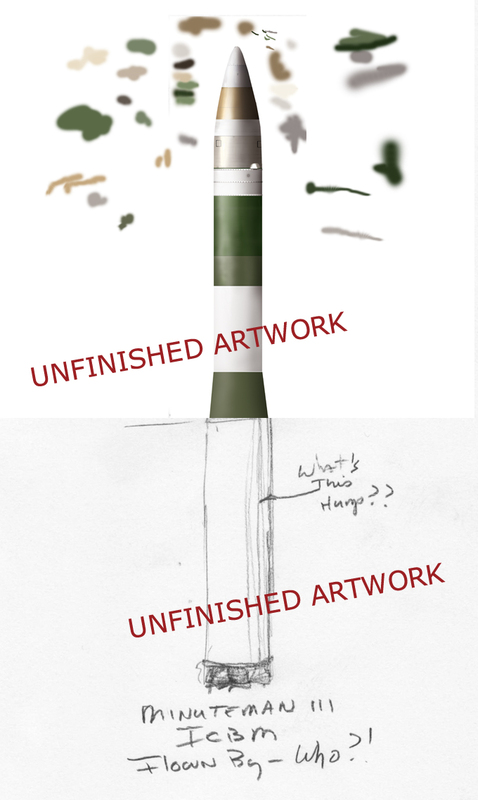 Maybe I'm already crazy because I couldn't help but see what a Minuteman III would look like in "proper" livery! he he. I hope it makes you chuckle because the next update leaves no room for comedy. Or mistakes. You can see for yourself that my latest project is not an airplane. It's a missile. 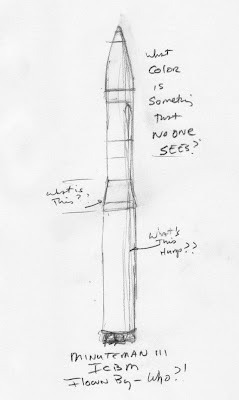 Specifically, an LGM-30G ICBM nuclear delivery device. 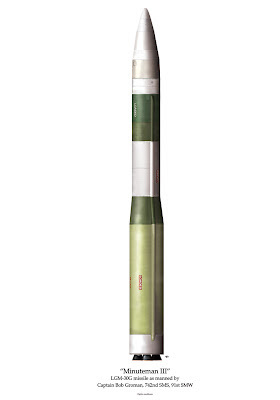 Or more commonly, "The Minuteman III." With an altitude of 700 miles, an 8,000 mile range and top speed of 15,500 mph, this bird is the "air craft" to end all aircraft. And potentially, all human life. It's a far, far cry from the shark-like lines of a P-51 Mustang or muscular hulk of a B-24...but when presented with the job, I simply had to say, "Yes!" on historical gravity alone. But make no mistake - this Godzilla-sized bullet may well be the best use of taxpayer dollars since the U.S. bought Alaska from Russia. Progress is going to move fast and definitely check back often. I've just begun my interview process, but all signs promise a fascinating perspective on our post-WW2 world. And I can guarantee that you will learn something new. Duck and cover, things are about to get COLD!